Okay, it was my intention to keep Julia Roberts a la Pretty Woman in the movies where she belongs with this outfit, but after uploading my first set of shots, I was worried that I may have done the exact opposite... so I added the jeans and did a couple more shots, but at that point Adelaide was up from her nap and yelling at me through the door, which resulted in me not checking that they were in focus, leading to somewhat blurry pics (which I tried to sharpen in iPhoto, which is a whole other issue) which I was not aware of until they were already uploaded. (I think that sentence may be in the running for some sort of run-on award.) So, while there may be time at some point later today for a third attempt, there is an equal chance that there will not. So, the somewhat blurry shot is what I'm going with. As is the version of this outfit which includes jeans, and thus, hopefully, ensures no Julia Roberts comparisons today. P.S. I realize now that I'm doing the same thing with my feet/legs in every picture, what can I say? Apparently that's what comes natural. Just gonna go with it, along with everything else. Good thing I wasn't counting on redoing any photos, because I ran out of time Adelaide ran out of patience as I was typing this post this morning, so here we are, afternoon, and I've yet to have been presented with enough time that attempt #3 would've been in the cards. I'll be lucky to finish the post now, because as I type Adelaide is jumping, grunting and having an all-around great time playing in her crib, rather than sleeping. I have absolutely no clue what kind of nap schedule she wants to follow these days. There's just been a whole heck of a lot of winging it around here lately. Not my strong suit. But what am I really trying to finish anyway? I'm just going on about a bunch of nothing, so maybe I'll just go ahead and call it quits on this one. 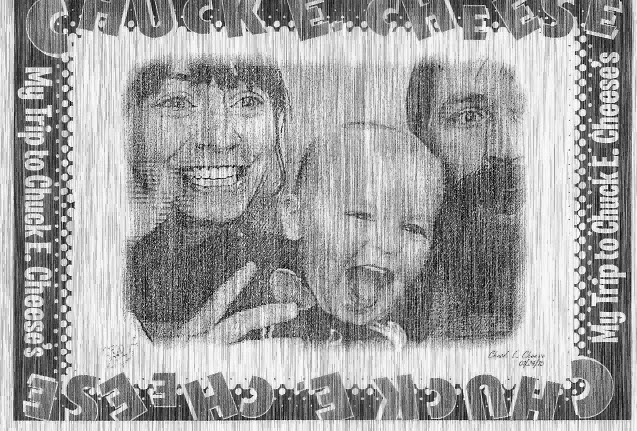 Just to add to the randomness, here's a picture one token got us at Chuck E. Cheese last weekend. Speaking of weekends, is today Friday? I'm honestly not sure if it is Thursday or Friday. I mean, I could find out incredibly easily, but I don't feel like closing this window or walking to the other room to hunt for my ever-lost phone. So I'll just abstain from any Friday or weekend wishes... I think it's Friday though. I'm like, 75% sure... oh the life of a stay-at-home-mom, eh? Not knowing what day of the week it is unless it is Wednesday, and thus story time at the library day. Julia Roberts' got nada on you girl! I love this outfit!! And btw...It is TOTALLY Friday ;) Give AdieLou smooches from Aunt Mah! Love the top/sweater/thing, it's so cool and casual!! !